A grave for a cat was built at the Ekou-in temple in Honjo. There is a reason for this. Near the vicinity of Fukagawa, a cat-lover and fish-dealer named Rihei would come to the house of Tokita Kisabu to sell some fish. Tokita had a mottled cat that he had kept for about four of five years, and Rihei never failed to toss a fish to the cat when he came calling. Hearing this, the cat’s head hung low as he slinked out of the home. He soon returned, bearing a single golden koban coin in his mouth. With this, Rihei was able to go back into business and once again returned to his custom of tossing a fish to the cat when he was on his rounds. The cat came calling once again to Rihei’s house, this time bearing a bounty of three coins in his mouth. Sadly, Rihei was not in and clerk at the shop was so startled by the cat’s strange appearance that he swung at the mottled cat and killed it. Rihei was saddened by this, and after discussing it with Tokita decided to use the money born by the cat to build a grave for him at the Ekou-in temple, where it stands to this day. This is a tale that comes from about 1300 AD. There was a temple in Nara prefecture called Kanko-ji, where lived a monk named Doutou. Doutou had come from Koma province (modern day of northern Chosen peninsula), and was a very tender-hearted and compassionate person. He noted one day that travelers had difficulty crossing the Uji river due to lack of a bridge, and so he supplied the funds from his personal savings to build a bridge for everyone’s use. Acts such as this earned Doutou the respect and honor of everyone who knew him. One day, Doutou was walking through the valley of Mt. 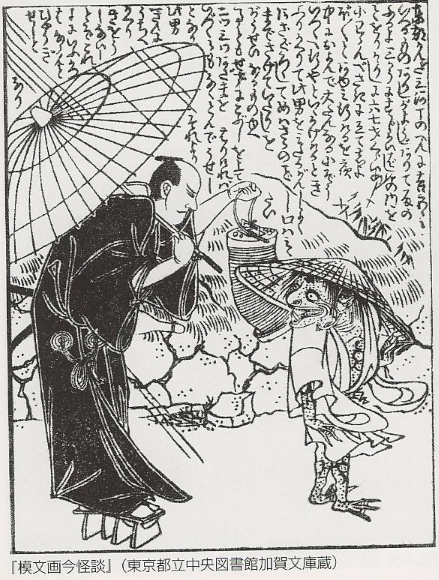 Nara with his disciple Manryo. Quite by accident while glancing on the wayside, he saw a skull that had tumbled down from somewhere. The skull seemed to have had a hard time, being covered in mud and looking like it had been kicked around by travelers on the road. There was very little meat left clinging to the bone, and then only in small places. Doutou felt very sorry for the poor skull, and turned around to talk to his disciple Manryo. As his mastered commanded, Manryo took the skull high up into a tree away from where it would be seen, and covered it with some branches to keep it hidden. This happened on the evening of the closing of the year. Soon after, a man appeared before the gates of Kanko-ji, asking to be shown inside. The man was infallibly polite in his greeting and manners, so the young man tending the gate guided him to Manryo. For his part, Manryo did not understand at all. However, because the petitioner had come with such heartfelt enthusiasm, he felt that the man must be telling the truth. There was nothing for Manryo to do except for to accompany the man out of the temple gates. When he arrived at the man’s house, Manryo was presented with a dazzling feast. While saying this, the man began to enthusiastically gorge himself. Manryo still wondered what he had done to deserve such rich rewards, but when he asked the man how exactly he had been of service, the man was quick to shut Manryo up by shoving delicious delicacies at him. There seemed to be no end to the offered morsels. Manryo, still a young man and given to worldly pleasures, was unable to resist. With that decided, Manryo dug into the food with as much enthusiasm as his mysterious companion. Never in his life had he tasted such delicious foods, and he was eager to try them all. Between the two of them, empty plates piled up like a mountain. Eventually, enthusiasm gave way to physics as Manryo could stuff no more food into his eager body. Thinking to relax, he was startled as he saw the man’s face suddenly turn a violent shade. Hearing this, Manryo was shocked out of his pleasant repose. His voice trembling, the man answered. To say that Manryo was surprised by this confession would be a gross understatement. But even in his panic and confusion he realized that being caught in this house by the murderous brother was undesirable, and so he jumped to his feet. But he was too slow in trying to escape, and he heard the door creak open and someone enter the house. The shock was too much for him, and Manryo froze in fright. The person at the door, however, was not the feared brother but instead the brother’s son accompanied by their mother. She saw Manryo standing rigidly in her living room and shouted in fear. Manryo let the story he had just heard poor out in every detail. He turned back to look over his shoulder and get confirmation from the man who had led him to this house, only to see nothing. The mother listened to Manryo’s story with as much shock as Manryo had. It was nothing like what she had heard before. The mother was very angry towards her son who had killed his younger brother. She looked down at the brother’s son and told him in her strictest voice. The young boy did as he was directed, and removed his father from his heart to be replaced by honored instead his uncle who had been good and kind. 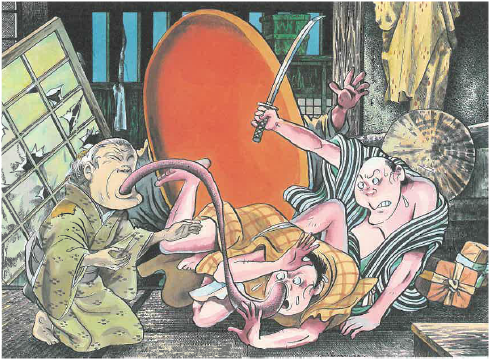 This story comes from the “Nihon Ryoiki,” Japan’s oldest collection of folktales and legends. That folktale collection was written in the 13th year of Konin (822 AD), and is mostly a collection didactic tales for teaching Buddhism. Crows flew through the skies forming black swarms, heading home to roost. They flew home on the autumn winds. Noisily, they gathered amidst the pampas grass. A samurai also was also walking through the wide field, heading from the South to the North. The sun was slowly sinking beyond the horizon, and against the setting sun the samurai was a solitary black silhouette. The autumn season meant that the days were short, and night fell at a rapid pace. Soon, across the dark field only a single light was seen wavering. The samurai pressed forward, parting the towering pampas grass and using the light to guide his way. At length, he came across an abandoned house, with slanting eaves and a broken door. From inside the wavering light could be seen. The samurai rapped on the old door. A head poked out from inside the door, with a shock of unkempt white hair and a face as wrinkled as a pickled plum. It was an old women, shoulders bent with age. Inside the samurai saw an old man dozing against a pole. When the samurai entered, the old man opened a single eye and offered him a greeting. With that done, he soon returned to his slumber. The square box wrapped in cloth and propping up his back while he slept marked the old man as a traveling medicine-merchant. The old woman motioned the samurai to a place near the hearth. Inside there were baking sweet potatoes and chestnuts. The old woman also took a kettle from the hearth, and prepared a cup of tea for the samurai. With that done, she sat at her spinning wheel and returned to her own work. 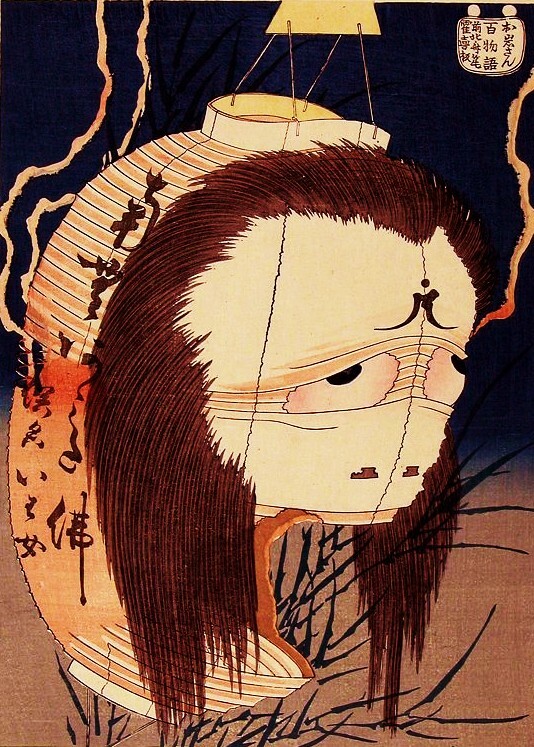 The rhythmic sound of the spinning wheel filled the room, and while the samurai nibbled at the sweet potatoes he was suddenly overcome with a strange sleepiness. Although he struggled to stay awake, before too long his energy was exhausted. He slumped over but fought to keep a single eye open, and with that he saw a long tongue stretch out and begin to lick the head of the medicine-merchant. That long tongue, looking like one of the lengths of yarn used in spinning, was stretched out from the mouth of the old woman. With that, the long tongue vanished in an instant. The sound of the spinning wheel continued as if nothing had happened. The samurai, still overcome by tiredness, fell into a light doze. Again he struggled awake, and again he saw the tongue stretching out towards the medicine-merchant. This voice came from the window. With that the window was jammed open and a huge serving plate with a face came pushing through. With that frightful vision the samurai’s weariness flew off of him. Like lightning the samurai drew his katana from his sheath, raised it over his head and brought it slicing down on the monstrous serving dish. But the dish was faster than the katana, and was back out the window while the samurai cut only air. The serving tray opened a wide mouth that stretched from ear to ear, and shook with the force of its laughter. The voice was as terrible as thunder. With the serving tray’s voice still ringing, the long-tongued old woman gathered up the old medicine merchant under her left arm and leapt out the door into the night. As soon as she passed through the frame, the entire house vanished in an eye-blink and the samurai found himself standing alone outside, still in the wide field of pampas grass. The samurai found shelter in a nearby pine tree where he tucked down near the roots and waited for morning. The next day, in a grassy thicket full of wild chrysanthemum flowers a pure white object could be seen. Looking closer, it was seen to be a fresh human skull, and nearby lay the square-box of a medicine-merchant. The crows, crying their disturbing call, flew through the sky as they always did. In Kanda, in the vicinity of the town of Mikawa, there was a man named Kichigoro. One late, rainy night he was out running errands for his business when he passed by through the gate leading to Sujikai bridge. There he saw a young boy, about five or six years old, shuffling along the path. “That is a brave kid to be out like this in the middle of the night…Hey, were are you going? He asked the young boy, and when the boy turned his face in answer, he saw a face with a swarthy completion, eyes the color of blood and a mouth that stretched across his face from ear to ear. Kichigoro was generally a brave man and so even this was not enough to shock him. But when he stretched his neck to take a closer look, the strange creature suddenly jumped into the shadows and disappeared. Kichigoro flew home as fast as he could where he quickly fell into bed.